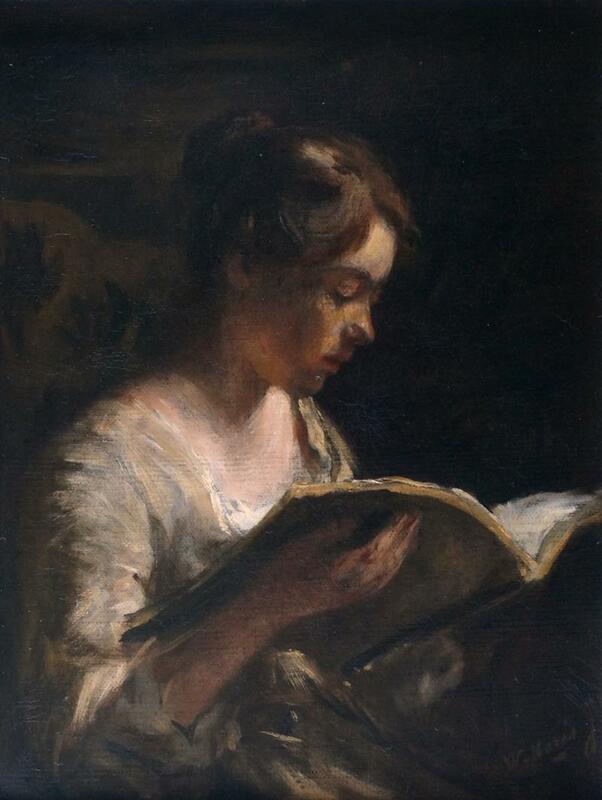 Young Girl reading a Book. 13 1/2 x 10 1/4 inches. Wenzel Maris, later called Willem, was one of the most significant of the group of artists known as the Hague School which aimed to revive the Golden Age of Dutch painting. Like their predecessors in the 17th century, the Hague School painters found inspiration in the flat open landscapes of Holland and the everyday lives of the peasant and fishing communities. Born in The Hague in 1844, Willem Maris was the youngest of three brothers, all painters. Willem's elder brothers, Jacob and Matthijs, effectively brought him up. When Willem was twelve they persuaded him to start sketching directly from nature. In Oosterbeek in 1862 he met the painter Anton Mauve who became a lifelong friend. In 1865 he spent some time exploring the Rhine with Bernard Blommers and in 1871 visited the fjords of Norway. Apart from this he rarely travelled outside Holland, devoting himself to depicting the Dutch countryside and painting sensitive portraits of humble working folk. He was influenced by Corot but this did not obscure his own vision. Willem Maris exhibited for the first time in 1863 in The Hague and went on to exhibit at the 1889 Exposition Universelle in Paris where he was awarded a silver medal. He also took part in the Exposition Universelle in 1900 when he was also a member of the Jury. Collections: Worldwide including Rijksmuseum, Amsterdam; Stedelijk Museum, Amsterdam; Museum Mesdag, The Hague; Glasgow Museum & Art Gallery; Montreal, Hamburg & Stuttgart.